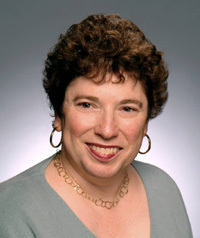 Claire Max, professor of astronomy and astrophysics and director of the Center for Adaptive Optics. Princeton University will present the James Madison Medal, one of its top honors for alumni, to Claire Max, a professor of astronomy and astrophysics at UC Santa Cruz who has developed techniques to enable astronomers to more clearly observe the universe. Max earned a Ph.D. in astrophysical sciences from Princeton in 1972. She will receive the award and deliver an address at Princeton during Alumni Day activities on Saturday, February 21. Max is internationally known for her study of plasma physics, astronomy and astronomical instrumentation, and especially for her work in adaptive optics. She is director of the Center for Adaptive Optics, which is funded by the National Science Foundation and headquartered at UCSC. Her current research in astronomy involves the use of adaptive optics to study merging black holes at the centers of galaxies. A pioneer in the field of adaptive optics, she created technology that removes the blurring effects of turbulence in the Earth's atmosphere, allowing telescopes on the ground to see as clearly as if they were in space. As a coinventor of the laser guide star technique for astronomical adaptive optics, she has helped revolutionize the capabilities of ground-based telescopes. "Claire has developed the techniques that let us see planets, quasars and galaxies with remarkable clarity," said David Spergel, the Charles A. Young Professor of Astronomy and chair of the Department of Astrophysical Sciences at Princeton. "This system enables the Keck Telescopes (in Hawaii), the world's largest, to make clearer images of objects ranging from planets to distant galaxies. Claire's work is essential not only for the current generation of great telescopes but is a key element in the next generation." Max is the first woman to receive the Madison Medal. She arrived at Princeton to earn her Ph.D. after receiving her bachelor's degree at Radcliffe College in 1968. Early in her career, she studied the plasma physics aspects of laser fusion at Lawrence Livermore National Laboratory, where she made important contributions to laser-plasma interactions and to the understanding of astrophysical plasmas. In spring 2008, she was elected to the National Academy of Sciences, one of the highest honors that can be accorded to a scientist or engineer. The Madison Medal is named for the fourth president of the United States and the person many consider Princeton's first graduate student. Established by the Association of Princeton Graduate Alumni, it is presented each year to an alumnus or alumna of the Graduate School who has had a distinguished career, advanced the cause of graduate education, or achieved an outstanding record of public service.